A black cross marks the grave of a narco who was decapitated. In 2006 alone nearly 400 people were killed in Michoacán State making it one of the most violent years on record. Little has changed since then. 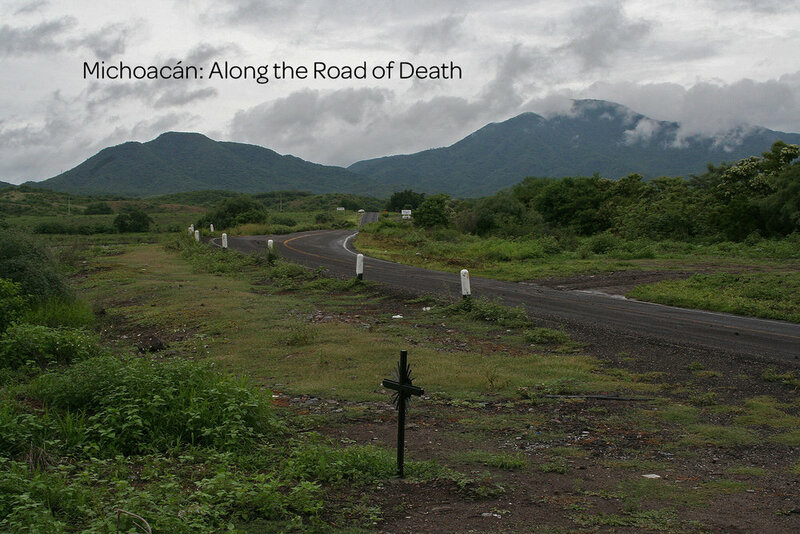 In 2006 the drug war in the Mexican state of Michoacán was peaking. Peaking in the number of drugs it produced, peaking in brutality and peaking in those murdered. There has been little stop in the pace of atrocities in the past 12 years. Consequently Michoacán State is one of the Mexican states where the most amount of migrants come from. The only way to stem the flow of migrants coming to the US border is to take care of the issues of dire poverty and violence that take so many lives here. In an effort to stem the violence police set up a checkpoint along one of the rural roads in Michoacán State, however such stops yield scant results. Due to corruption such operations are not announced in advance, even to officers who participate in the searches, for fear that locations will be passed on to the drug cartels. Michoacán is vast and I drove a lot on that trip in 2006. Death was pervasive. It hung in the air heavily and it was waiting for me at every location I arrived at on. From morgues overflowing with the dead, to roadside memorials of black crosses marking where decapitated corpses were found, to houses that had hundreds of bullets pumped into them, each stop became darker than the next. A corpse lies on an examining table in a police station. The victim's house was sprayed with bullets after which assialants entered the house and executed him. A police official sorts bullets after a drug murder. A young boy sells news papers at an intersection in Uruapan, Michoacán State. Taken in 2006, I wonder if this boy is still alive, or joined a cartel or fled to The United States. Newspaper clippings of the daily violence in Mexico. A morgue ledger of the dead, mostly murdered. Being a photographer from The United States and working for a major news organization (NPR—the initial report can be seen here) gave me an amount of protection, however it was not total. One stop on the trip took me to Michoacán’s supreme court where my colleague Lourdes Garcia Navarro was interviewing a judge. To enter the building, I had to go through a series of security checkpoints and was searched numerous times. Inside the highly guarded courthouse I had a sense of safety, however that was an illusion. After we left the building we dropped off a Mexican colleague we were working with. From the courthouse my destination was to drive 90 minutes into the mountains to find a house that had been shot up the night before. This was far into cartel country. Just as Lourdes and I arrived in front of the bullet ridden house we received a call our colleague that we dropped off near the supreme court: just after we had turned the corner after dropping him off he was picked up by a cartel, put into a car and threatened never to report on or help anyone else report on the murders. Sitting outside of the house the timing was frightening and was not coincidental. They had followed us out of the highly secure court house and, deep into their territory they knew we were there too. The fate of my life was in their hands and the only reason why I lived is that they let me. The drive out of the mountains was long and tense. Every car that approached from behind or turned in front of me was suspect. Beheadings, dismembering and stories of people being dropped into vats of acid while still alive were all things that I had heard in the preceding days. While La Familia Michoacana claimed to kill only for purpose many others didn’t. They killed for cruel sport and whim or if someone got in their way. Perhaps I was getting int he way of La Familia Michoacana's business by taking pictures? While I knew that my life was totally out of my hands on that day I felt that the odds were still in my favor. I held a passport that would invite retaliation should I be found alongside the road like the others. Even though that very long drive out of the mountains was extremely tense my life was not worth it for the families who controlled the region and they let me pass. I write this as a first-hand illustration not to tell of what goes into reporting on stories like this, but to illustrate as directly as possible of what people in Michoacán must contend with on a daily basis. To even honk one's horn at the wrong person can end one's life. Having been so close to the death that stalks the land of Michoacán it’s understandable that so many are leaving, risking their lives taking The Beast and trying to get as far away from the slaughter as possible. 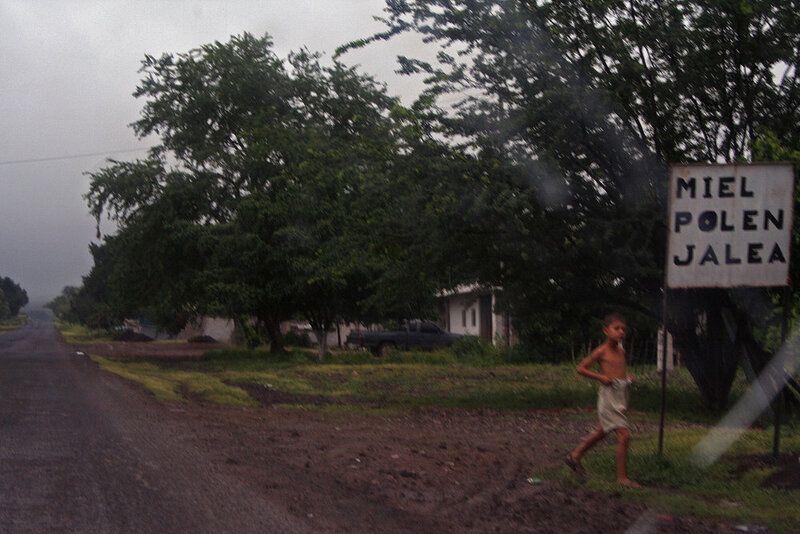 A rural back road in Michoacán State. Such areas are abjectly poor resulting in Michoacán being one of the states in Mexico where people emigrate to the United States in high numbers. The state is known for its productive agriculture, however growing drug crops yield a much higher profit. What a farmer grows in a week equals the amount a laborer would make in a month picking crops in California. On September 6th a drug cartel that called itself La Familia Michoacana rolled 5 decapitated heads onto the dance floor of dance hall called Sol y Sombra (Sun and Shadow) in the town of Uruapan with an accompanying note calling their rule “divine justice.” They further said, "The Family doesn't kill over payment, doesn't kill women, doesn't kill innocents," the note says. "Whoever needs to die, dies." Narcocorrido or narco ballad CDs sold in plazas is a subgenre of the Mexican norteño-corrido (northern ballad) music genre. Much of the music celebrates narco culture. Bullet holes in the ceiling of Sol y Sombra or Sun and Shadow dance hall that is known to cater to those working in the drug trade. This is where five heads where dumped on a dance floor. Still at this time nobody is exactly sure why the heads where deposited there, but many believe that it was a warning to the clubs owner. The hard streets of Uruapan in Michoacán State.